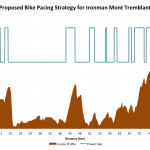 I think the concept of strategy in an Ironman or other endurance event can be misleading. For the vast majority in long distance events the main challenge is possessing the mental toughness to give the performance their body is capable of. Strategy in an Ironman exists at the very front of the field amongst the Pros and to a lesser extent the fastest age groupers. A pro can’t afford to have any true area of weakness. Amongst pro results you often see tactics coming into play. Ironman Western Australia’s course should have some blistering times, but typically pro bike splits aren’t exceptional. On such a flat course too much effort is required to put a significant gap into the field. The run is similarly flat and that’s where the race happens. Pros watch each other on the bike aiming to conserve as much as they can for the real work on the run. As an age grouper with podium finishes to my name I’ve never been involved in such cat and mouse games. That’s not to say I don’t have a race strategy. In fact as I mentioned last time I write a race plan out the day before and commit it to memory. Generally the strategy is simple, but shares some elements in common with a conservative pro race. Your approach to the swim obviously varies according to ability. The fastest and slowest swimmers have simple choices, but for the rest of us stuck between things are a little trickier. 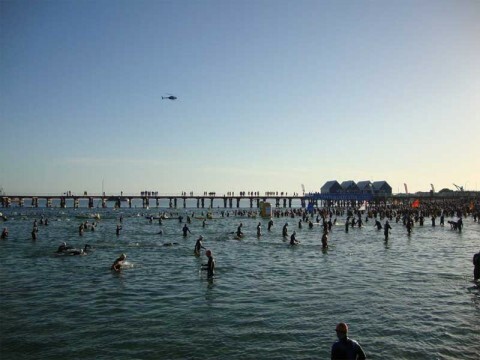 There are plenty of athletes capable of swimming an hour for 3.8km. My approach is to place myself confidently going a little further forward than my actual swim pace might dictate. I try to go to one side of the field or the other on the principle that there’s room to escape should things get rough or I get blocked in. The aim is to be pulled along by swimmers around me and achieve a slightly faster time for it. Positioning can backfire as in Kona when my section of the field was herded into the middle resulting in far more crowding, a lot of blocking and a fair few blows to the body. 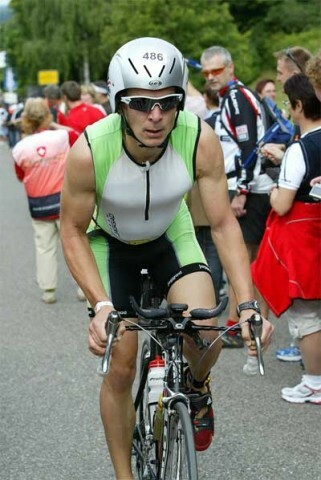 Worse was my mistake in Ironman Australia where I held position behind the line as the field crept forward. Expecting them to be pushed back before the start instead I began two or three rows further back when the cannon fired. The important lesson is move with the field! I adopt the attitude that I need to work the swim. It’s a balancing act of course, but I have to feel my arms have worked and can enjoy a rest on the bike. I’ll go out hard, but avoid sprinting I’ve learnt the error of that one! Everything turning to treacle 400m in is not a pleasant experience. Throughout the focus is on my stroke. For the next hour I’m aware of every stroke and if it’s moving me forward successfully. I’ll typically find myself counting or humming a rhythm to help with timing and pace. Whatever the outcome when I get out of the water the time on the clock is what it is. Under the hour I’ll take a confidence boost and I’m set for a good race. There’s nothing I can do if I took longer, but the key is it doesn’t change my race plan. I have work to do and success comes down to that plan. I like to use a combination of perceived exertion, power (when available) and heart rate in that order of priority when racing. Ultimately how I feel decides how I keep going. Power and heart rate values act as spurs to push me more – if I see them drop I want to go harder. If perceived exertion warns otherwise I need to heed the warning or potentially pay later. There’s a golden rule that when a competitor passes you it means they’re either faster or they’re going to hard. If it’s the former there’s nothing you can do for now and if the latter you’ll be seeing them later. It’s an important rule that stops you wasting energy over longer distance events. You can’t try to respond to the actions of others round you surging is significantly tiring. I’ll add a little caveat here. When someone passes you make an honest assessment of your effort. Is it where it should be? Have you eased up? If you’re feeling good and think there’s a little more attempt to keep pace. Don’t put in a large push to hold on, try to use them to motivate just a few more watts out of the legs. If it’s too much back off. This is a mentally challenging aspect of the race. Letting competitors pass you early on is unnerving. You’ll start wondering if you’re weaker than you think? Am I really a top age grouper? You have to accept they’re pacing is bad because 99% of the time it’s the truth. 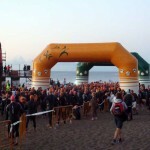 Take Lanzarote this year the first half of the course was tough and I seemed to be endlessly losing ground. It was a real challenge to keep pushing, but I reassured myself I knew my body, my pacing and the island. Sure enough by Mirador del Rio people were slowing and coming back to me. Over the latter half I reclaimed numerous places by being fresh enough to push hard in easier terrain. Throughout the day remind yourself why you’re there. The choices you’ve made and sacrifices involved. When the going gets tough and it always does I consider how I’m doing what I love. I wanted to do the race, I put all those hours in and I’m lucky to be here racing. I can hurt in the present because the longer term rewards far out weigh a little discomfort. Think back to the toughest training sessions and how you coped. I’ll be remember running sub 4:30 kilometres for the La Santa half-marathon after four days and 90km of run training. If I can do that in training then I can do it tapered in a race. There’s real value in having some truly challenging blocks in your training cycles just to help mentally push through the hardest parts of endurance events. If the strategy works the back half of my ride will be of a higher standard than the first. Relative pace will pick up, I’ll move through the field and I’ll draw lots of positive energy from this. I tend to push hard in the final 10 to 20km. Perhaps being more conservative would be better, but I feel good and want to carry that momentum into the run. Head out on the run comfortably. I can almost guarantee you’ll find that whatever you think your doing your initial pace will be faster than you plan. Watching that pace is key. Take every split you can and be guided by it. I rely purely on perceived effort at this point. Every kilometre I’ll check my pace and aim to keep to my race goal. If perceived effort is shooting off the chart I’m forced to back-up. In the early phase of the run if you’re passed it’s best to let them go. You need to be cautious pacing off others early in the game. The potential to go beyond your limits chasing a faster athlete is obvious, but also you can be subtly slowing. 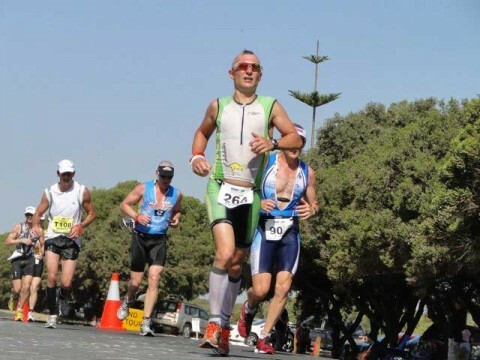 My first time at Ironman Western Australia I paced a couple of laps off a competitor and felt great. Suddenly he broke into a walk and I realised we’d been slowing over the last 5Km! No wonder it seemed so good. Those pushing hard early in the run will generally come back to you. Sometimes not till the last 200m as in Ironman New Zealand this year. The cost of pushing the first half of the marathon can be massive, as bad as over cooking the bike. Unplanned walking at any point in the latter part of the day will have a devastating affect on your finish time. I can’t emphasise pace awareness enough. Know your race pace from training, wear a watch and monitor pace then respond and adjust your effort. I’m going to add a caveat again. Much as I emphasise this conservative approach you may need to make a call. If you’re 10km in running kilometres five seconds faster than expected and feeling great I’d stick with it. Sometimes you have to take the chance and if you’re being consistent, not surging and its working that’s great. Be aware when you reach the final 10km and be mentally prepared to respond. If you’re there without significant slowing or walking the game has now changed. Focus on run form and start to dig deeper it may not translate to faster, but effort levels have to rise. I go from a comfortable conversational aerobic run pace to a laboured breathing pattern. From this point on nutrition will not sit well in my stomach, make sure you fed before hand. I should at least be at my standalone marathon pace, ideally faster by the last kilometre. This is about getting to the line quickly and efficiently. If someone goes past you now go with them. Even if they’re a lap behind you use them. If they’re on the same lap that’s a finishing place you don’t want to give up. Latch on, focus and push. It may be hard, perhaps it’ll be too much, but you’re closing the final kilometres. When you reach the line it’s over and you know you can make it. I’ve latched on to faster runners in a number of races. In Kona 2009 I ran with a guy for most of the final 6 miles. We helped push each other along. As we approached the return to Palani Drive I surged uphill trying to drop him. It backfired as the hill proved longer than expected and he blew by over the top! Sometimes those surges work. In Ironman New Zealand with 10K to go two competitors came by at pace. I latched on, took the lead, threw in a couple of small surges and suddenly they were gone. Too hard too soon in their cases. Later I worked with another competitor and we pushed each other for the next few kilometres. With 1km to go he cramped and I went hard to build and hold a lead. It was one more place in my age group after all! Finally the finish line. From two or three kilometres out it should be the hardest effort you can sustain and just keep pushing for more. Even if you have images of Julie Moss in your head you will make it. Hard as you can may be slower than you hope, but aim to finish strongly and perhaps gain a place or two. The race isn’t over until the line and I’m not afraid to take places in the finish chute.